You see? “A few days later”, “pleasant surprise”, “immediate impact“. They can, you can’t: why? “It can’t work here! We are different!”. I see: you are making that difference too. Just a brief to celebrate how glad I am to be in Madrid today to attend the first ALE Gathering tonight, at the end of the XP 2011 sessions. We’ll be discussing the vision of the network and – my personal aim, at least – we’ll get this chance to have some face-to-face conversation. I am proud today to represent the bulgarian community instead of the likely more obvious italian one. I heeded Javor Nikolov’s call to solve their delegates’ availability issue and I considered how fat the italian delegation would be even without me. So, here I am today: in Madrid, as an italian, to represent Bulgaria. All in all Agile Lean Europe is all about networking in Europe, isn’t it? Today is the 150th anniversary of the unification of Italy and, in spite of the many unsolved issues about actual unity of Italian people, today is gonna be a day of celebration. Most of those issues are both cause and effect at the same time of a still strong linguistic divide, that tenths of years of unified school and television haven’t solved yet. 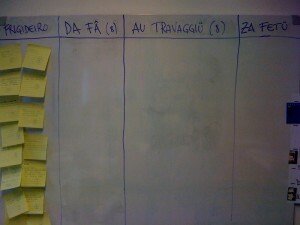 In my activity as a coach then it’s quite usual for me to join teams all across the boot, from northern Milan to Rome through Genoa, and it’s as much as usual to face the actual italian language the team uses in its day-by-day informal communication. Let me make it clear: people across Italy can speak the same language and have perfectly joint conversations, no matter where they are from, but still – you know – choosing the right word and exploiting the right expression can do so much in building a relationship between people, through an implicit communication channel that refers more to the emotional intelligence than the mere communication of data and facts. Words and expressions are memes and anthropology tells us human communities gather around memes. All in all what are the consequences of this dual language? At least two. First, as long as the informal communication within team boundaries is taken on a side-track, the team itself feeds and maintains a gap that makes it easier to incur in misunderstanding, introducing errors in the even flow of knowledge. Second, and even more important to me, a team upholding a dual language layer is upholding waste: the waste brought by any translation process. Sharing an actually common language is a way to shorten our feedback loops and a leaner way to manage knowledge. It is indeed one of the key-point in Domain Driven Design first conceived by Eric Evans. A problem is something we can see as an opportunity or as something defeating our effort towards our goal. As long as a problem is seen as a boundary to make our way around, it can be seen and felt as an opportunity, a constraint making us able to model a solution. In my case I took the chance to exploit my country’s linguistic divide to get a stronger buy-in when introducing task boards or kanban boards. 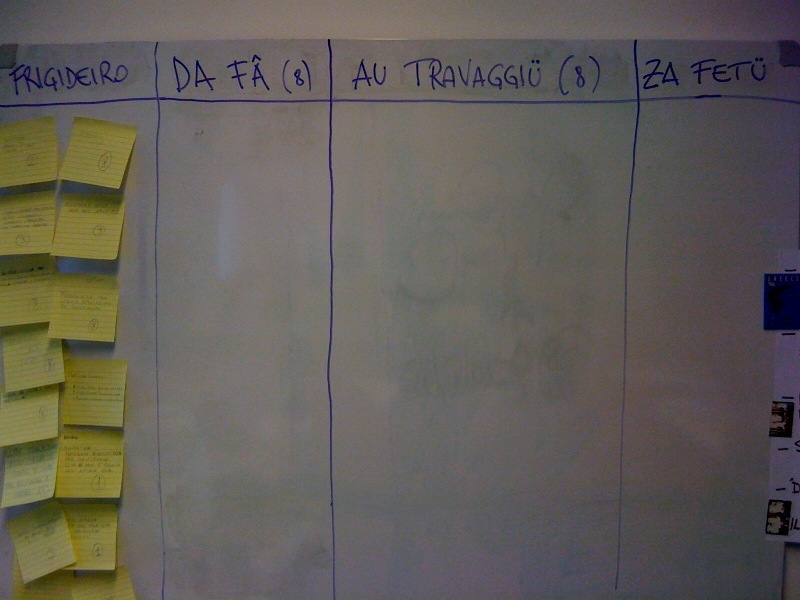 Since I first tried with a team based in Ancona, on eastern coast of Italy, I know that writing column labels in local dialect makes the team more focused on the workflow status the column represents instead of the column itself as a tool. So while in Ancona Done becomes Porta, in Genoa it becomes Za fetü. Put in terms more familiar to those who, like me, got into the whole agile & lean thing through Extreme Programming, this is following the principle of Diversity together with the principle of Opportunity in the pursue of the value of Communication. It goes so far as to say that diversity built-in could be a chance for the future of Italy itself, if we only learned how to live enhancing the opportunity it is instead of focusing on diversity for diversity’s sake. What else is left to say? Buon compleanno Italia.